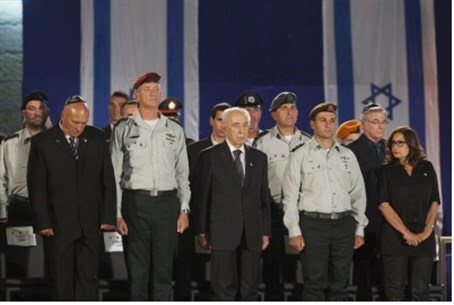 President Shimon Peres delivered the following speech Sunday evening at the Memorial Day ceremony, at the Western Wall in Jerusalem. "We accompanied our children when they came to the world, we were with them on their first day at kindergarten, we took them to class on their first day in first grade and we took them to enlist in the army, we walked beside them on their wedding day and to their first home. Suddenly lives were cut short and then the cloud does not disperse, it carries the image of the soldiers who fell in Israel's battles. Even at the greatest celebrations we feel a stab in our heart: How won't they be at the birth? Why won't they hold hands on the way to school? How is it that they won't be a part of raising the children? Why did all their friends grow up, studied, get married, start families – but my son, my daughter, my brother, my husband will remain forever as we saw them at the moment before parting. Each word is a will and testament left behind. To be as moral as the ten commandments. To be courageous and heroic. To be a constructive and enlightened society. To be a free and democratic state. To be a nation seeking peace. Many of them did not build a house. Did not have the opportunity to plant a tree. Did not fully taste love. They left you behind, the bereaved families, to cry for them. And they left us, friends, to feel pain but to remember and to remind. We will not minimize what we have achieved, a unique country with a spirit of strength. We will not let go of the memories of all that we have lost. "Writers who will write no more, poets, scientists, soldiers, farmers, carpenters and ironmongers. Wonderful people, dedicated citizens, original creators who will no longer experience life and our nation will not benefit from their contribution. We speak here in plurals, 'we lost', 'we dreamt', 'we wanted' but first and foremost dear families, it is your pain. The individual loss. The individual pain. The personal grief. We can only embrace, respect and remember. Knowing that we are a people without a choice. To fight or to die. It is because of them that we are. "We are mute in front of you. Before the heavy sense of bereavement. There are no words that can express your pain while we know that nothing in your life can be similar to before that hesitant knock at the door. What can we say before you? Be strong? You are strong. Can we comfort you? There is no comfort." Chief of Staff Benny Gantz said at the ceremony, "From our nation's Wall of Memory that we are now facing; From the rocks of hope that accompanied our country in the war for life and the dreams of peace; From where past, present and future meet – are reflected the young and life-filled faces of your loved ones, the boys and the girls, trusted emissaries of the Nation of of Israel. They accompany us in their image and their absence on every step, every intersection that life throws at us here. They are missing in the ranks of the IDF ranks, in the ranks of a pained and longing society, whose struggles are not yet over." "In this moment of awe, when I review your gaze and tearful eyes, I go back to all those painful hours we've shared over the years, from the moment in which bereavement crossed your doorstep, bringing the painful darkness that has no consolation. As the sound of sirens pierces the mists of memory, I go back to my friends, my comrades and partners, who have built, stone by stone, the wall of Israel's security. I remember their laughter, their gaze, the glow of their faces. I carry with me their determination and belief in the righteousness of their way. I remember them and gaze at their successors – at the soldiers and commanders of the IDF, at our forces."